Use this document as your “how to” guide to the AVSAB website. The website features many social functions that were not present on our old website. To take full advantage of this, read through this document and explore these features on our website. If you have any questions that are not covered here, please feel free to post them in our support forum. Click on a link below to jump to a specific section of the documentation, or browse by scrolling below. We’ve put together a 3 part series that walks you through the features of the new website. If you’re a AVSAB member, we recommend updating your profile at least once a year. 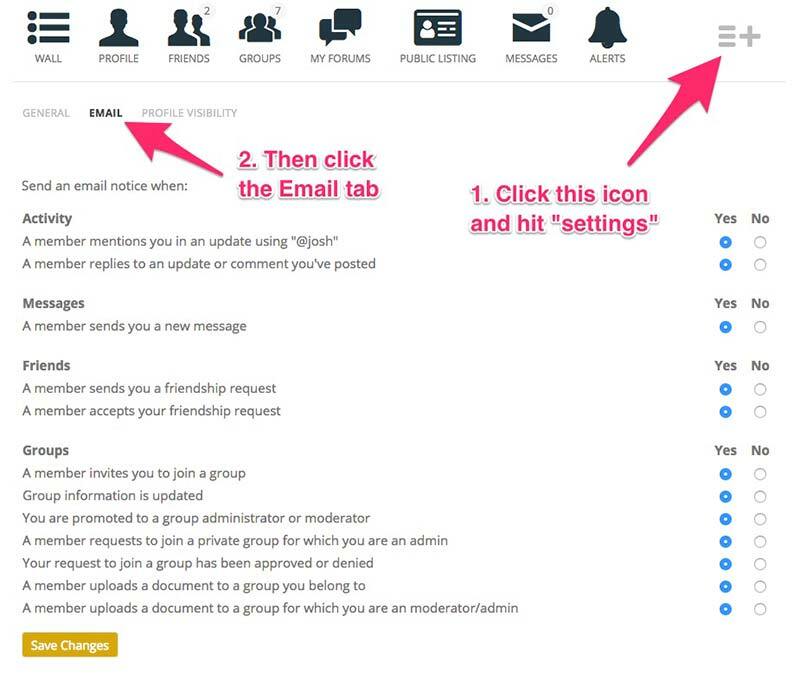 If you’re a new member, it’s a good idea to navigate to your profile page and make sure that your information is correct, as there are some fields that are not available on the sign up form (such as social media links). The third set of member information for you to update can be found under the “Social Media Links” section. This allows you to post links directly to any active social media accounts, including Facebook, Twitter, Linkedin, Google+ and Instagram. This is a great way to let other members know where you are active on the web and provide links to your accounts so they can follow you. Click on the “my profile” link at the top right of the page (this link only shows up if you’re logged in). From there, you will see a round photo with your cover photo set behind it. You have the option of uploading a photo, taking a photo from your computer or mobile device if it’s able to do so. To upload a photo: simply drag it onto the green area of this page, or click the “select your File” button to select a specific file from your device. You will then be given the option to crop the photo to your liking. From the “my profile” page, click the “change cover photo” link. We suggest you use an image that’s horizontally oriented an at least 1400 px and 440px tall wide. If you’re looking for a place to find a beautiful and free cover photo, we recommend unsplash. If you’d like to update your password, from your profile click on the settings icon (gear icon). In some instances you may need to click on the “more tab” of your profile menu to display the settings icon. This will take you to the settings > general tab. Enter your new password twice and click “Save Changes” to update your password. **If you are unable to log into the website, you may request a new password by going to the login page, and clicking the “Lost your password?” link. You will be prompted to enter the username or email address associated with your account, and an lost password email will be sent to you. There are a number of ways that you can find and connect with other members. One way for you to find other members is via our member directory. You can enter anything into the search bar (name, state, country, animal, etc) and the system will return all matching results. For example, if you want to search for someone in Florida, enter “Florida” into the search bar. This will bring up a list of all members that mention Florida in their profile. If you’d like to narrow down your search to just professional, affiliate or student members, click the tabs underneath the search bar. We recommend experimenting with different searches to get a feel for how the member directory searches work. If you’d like to see a list of all members of a specific member type (i.e. professional, affiliate, student, etc) click on their tab on the members directory page underneath the search bar. Clicking on the “Order by” field gives you the option to view the members list (full and filtered by search) by the last active members, recently added, or alphabetical. The AVSAB website allows you to make professional connections with other members by “friending” them, similar to Facebook. It’s a great way to keep track of other members and their activity. Similar to Facebook, friends are able to post directly to your wall. 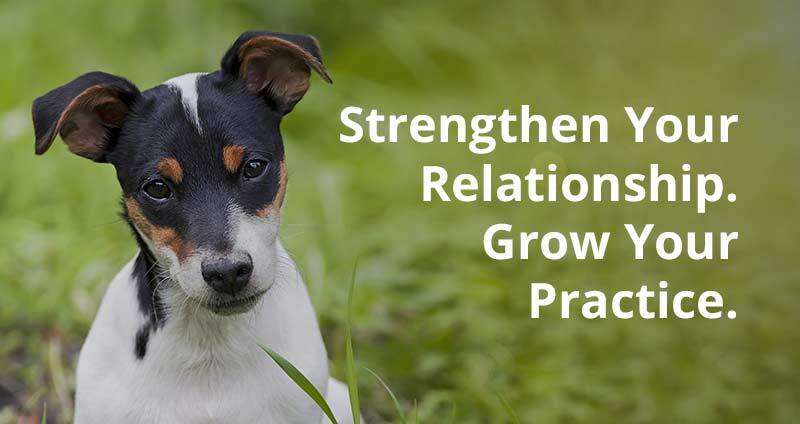 To make new friend connections, you can browse or search our member directory. Click on any members name or photo from the directory page to view their wall, or click on the “profile” icon to view their profile. If you want to add any member as a friend you can do it either from the main member directory, or directly from their profile page. From the member directory: Click on the “Add Friend” button. From a members profile page: Click on the “Add Friend” button underneath their profile photo. If you click the add friend button, that member will receive a notification that you have added them as a friend and they will be given the chance to add you back. Once they do so you will receive a notification in the “Alerts” section of your account. Go to the member directory and click on the “my friends” link underneath the search bar. From your profile page, click on the “Friends” icon to view your friend list. To approve a friend request, navigate to your profile, click the “friends” icon, and then click on the “new requests” link. You will be shown a list of your friend requests, which you can either chose to accept or reject. Go to the member directory, search for the friend you wish to cancel or click on the “my friends” link underneath the search bar, and click cancel friendship. From your profile page, click on the “Friends” icon to view your friend list. Find the friend and click the “cancel friendship” button. On the AVSAB website you have the ability to message other members directly. This can be a great way to ask specific questions of other members. Messages can be either public or private. These are messages sent directly from one member to another without anyone else seeing it. There are several ways to send a private message to another member. Find the member that you would like to send a message to on the member directory page. You can do this by browsing, searching, or clicking on the “my friends” tab. Once you locate the member you’d like to private message, click on the “private message” button. On the following screen, you will see the form for the private message. 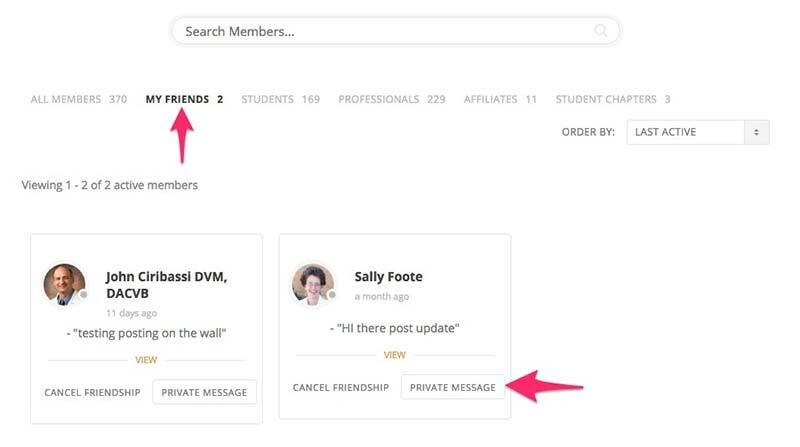 If you’d like to include more than one member in your private message, add their name in the “Send to (username or Friend’s Name)” field. If the additional person is already your friend, the system will auto suggest their name when you start typing. Then enter the subject and message you’d like to send and click on the “send message” button to send your message. Navigate to the members profile page and click on the “Private Message” button, located underneath the member’s profile photo. To compose a new message from your profile page, click on the messages icon. This will take you to your messages inbox, where you’ll be able to see a list of all of your messages. Click on the “compose” tab in the messages sub menu. **Please note that you can enter multiple names simultaneously in the “Send To” field, allowing for group messaging. If you’d like to send a public message to anther AVSAB member, you can simply use the @username symbol similar to Twitter and Facebook. There are a number of ways you can use this on the website. Whenever you are adding a new post, comment, or reply on the AVSAB website, typing the @ symbol will bring up a list of your friends that you can include in your public message. This also works when using the forums. Those friends will then receive a notification that you mentioned them in that post or reply. This is a great way to draw attention to specific posts an encourage input from others. You can also navigate to a members profile page and click the “public message” button located under their profile photo. That will bring up the “post update” form, with their @name auto-filled in the form. To see a full list of all of your messages, including read and unread and starred messages, navigate to your profile page and click the “messages” icon. You can also “star” important messages by clicking on the star icon in any of your conversation threads at any time. This can be helpful for bookmarking important conversations for easy retrieval later. You can see a full list of all of your sent messages by clicking on the “sent messages” tab in the messages area of your profile page. If you have your alert settings saved to deliver an email alert whenever someone messages you on the AVSAB website, you can respond directly via email. Simply open up the message in your email and compose your reply above the “reply to” line, and click send as if it were a normal email. Your response will be automatically posted to their account, and they will receive an email notification of your reply. The AVSAB wall works similarly to your wall on Facebook. You can post information and updates to your wall and they will show up in your friends news feed. You can also post to on any of your friends wall’s by navigating to their profile page and using the “post update” box at the top of their wall. Navigate to your profile by clicking on the “my profile” from the menu at the top of the page (this only shows up if you’re logged in). Then, click on the “Wall” icon in your account. You can compose your update at the top of the wall page by entering text underneath the “What’s new, [your name]” text. You can also add an image, video, or link by clicking on the according icon. Adding Images: You can upload a file directly from your computer or mobile phone by clicking on the image button, and then “Upload File.” You can also add an image by linking to it directly from somewhere on the web. To do so, click the “Add image URL” button after you click on the add image button. Sometimes you may not want all AVSAB members to be able to see your wall posts. By default, all posts are set to be shown to everyone, but you can also change these settings so your post will be shown only to your friends, or your self. To set the privacy of your post, click on the option titled “everyone.” In this box you will be able to select to post either to everyone, your friends, or only you. Underneath any post you see on the site, you will be given the option to comment or like the post, similar to Facebook. To do so, simply click on the “Comment” button to post a comment, or click on the thumbs up icon to like the post. If you want to unlike a post you have already liked, simply click on the button again to unlike it. The AVSAB website keeps track of your likes so you can view them later. To view your likes navigate to your wall, and click on the “my likes” link. Commenting on a post will begin a comment thread, and the author of the original post will be notified of the comment in their email if they have chosen to receive comment notifications in their settings. Your news feed is where you can see specific activity from other members across the site. The content of your news feed consists of other member activity. It’s a great way to keep tabs on what’s going on with AVSAB, and give you opportunities for engagement. We recommend bookmarking the news feed page, as it is similar to going to the “home” section of your Facebook account and a great page for viewing the latest activity from other AVSAB members. The groups tab is a new feature of the AVSAB website. AVSAB groups are gatherings of members, posts, and any other user-generated content from within that group. Think of AVSAB groups as working similarly to Facebook groups. Each group has it’s own wall that members can post to, and a group forum where group members can engage in discussions related to the groups topic. To find groups, browse the directory of AVSAB groups by clicking here. You are free to join any public group, or if you’d like to join a private group, you can send a membership request from the groups directory page. Public: any avsab member is free to join these groups. Group activity is visible to all members. Private: group administrators must approve group members. You can request memberships to these groups from the main group directory. Group content is only visible to members of the group. Hidden: groups visible only to group members – not shown on groups directory page. Membership is by invite only, and content seen only by members. 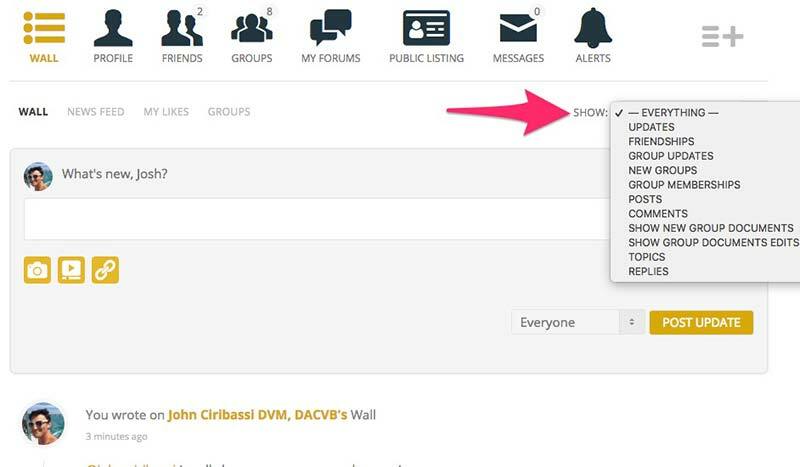 **Please note that site administrators can still see hidden groups. Group interaction happens primarily through the group wall where members post updates and information, and through the group discussion forum. Groups can also upload documents and share them with the rest of the group. We hope you enjoy the new groups function of the website, and encourage you to join and create groups! To create a group, navigate to the groups page and click on “Create A Group” link. When you are done setting up your group, click the Finish button. By default, the member that creates the group is the administrator for the group. Administrators are able to promote or remove other group members. Groups must have at least 1 administrator. Change group-wide settings. 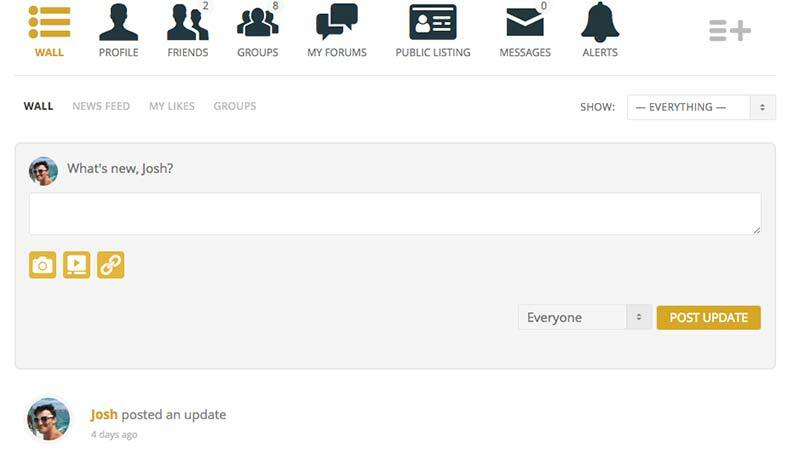 For instance, administrators can turn group forums on or off, change group status from public to private, and toggle on or off various other group functionality. Change the group profile photo. Administrators can promote other group members to be moderators and administrators. Each group can have more than one administrator. To promote a member, navigate to the group homepage and click on the settings (gear) icon. From the group menu, click on the “members” link. This will bring up a list of group members, and you will be given the option to promote any member to the moderator role or promote to admin. Administrators have the ability to remove or ban group members. To do so, navigate to the group homepage and click on the settings (gear) icon. From the group menu, click on the “members” link. This will bring up a list of group members, and you will be given the option to “kick and ban” or “remove from group.” We advise group administrators to only use this option under extreme circumstances. Settings: Change the privacy options of the group. Options include public, private, or hidden. Photo: Upload a new profile photo. Cover Image: Upload a new cover image for the group. Members: View all of the members in the group and promote, remove, or ban members. Documents: Change settings for who has permission to upload documents – options include all group members or only group administrators and moderators. Administrators can also set up category lists for documents from this page. Forum: Add or remove the forum from the group. Forums are one of the primary ways that members communicate on the AVSAB website. There are a number of opportunities to engage through the use of forums. You can find the main forum directory on the forums page. We’ve put together a 2 part series that walks you through the forums on the new website. Members – this forum is available to all professional and affiliate members. Student members do not have access to this forum. Students – forum for students. Professional and affiliate members also have access to the student forum, and we encourage their participation. Support Forum – use this forum to ask questions about the organization and how the website works. If you have a question about your individual account, please use fill out our member support form instead. Many of the groups on the AVSAB website have their own forums. If you are a member of any of our groups you can participate in these forums as well. These groups are listed on the main forums page, and are also accessible from the individual group home page. As an AVSAB member, you are able to subscribe to individual forums, or to individual topics created within those forums specifically. When you subscribe to a forum you will receive email notifications whenever there is activity in the forum. Subscribing to a forum or topic ensures that you stay up to date on the latest developments on the AVSAB website and gives you the opportunity to help other members when you have an answer to a question. To subscribe to a forum, navigate to the main forum page, click on a forum, and click on the blue “subscribe” link at the top right of the page. If you’d like to unsubscribe from any forums or topics, navigate to either the forum home page or the topic page, and click the blue “unsubscribe” link at the top right of the page. The new AVSAB website has “reply by email” functionality built into all of our forums. When you subscribed to a forum you will receive email notifications for each any activity within that forum. The email will also contain instructions about how you can post a response to directly from your email account without having to log into the site. Forum signatures allow members to create a custom signature to be used on all of their forum posts, similar to the an email signature. To create a custom email signature, navigate to your profile via the “my profile” link from the top right menu of the AVSAB website. Click the “Edit” button, which takes you to the “general info” profile fields. Scroll down to the bottom of the page where you will see the “Signature” field. Enter your signature in this text area. Please note you have a number of formatting options for your signature including bold, italic, & underline. You can also insert a link to a personal website and more. **Please note that updating your forum signature will update your old signature, or add one if you didn’t already have one, across the entire AVASB website. A list of all of your active forum and topic subscriptions, along with the option to unsubscribe. Click on the individual forum to jump in and write a reply. Alerts on the AVSAB website are notifications of activity across the site. You can set your alert preferences so that you only receive alerts for activity you’re interested in. You have wide flexibility to set which alerts you’d like to receive emails for, and which one’s you’d rather not. To set your preferences, navigate to your “my profile” page, and click on the settings (gear) icon. Click “email” from the settings menu. This will give you a list of email activity options that you can toggle on and off. Be sure to click “Save changes” for your preferences to go into effect. 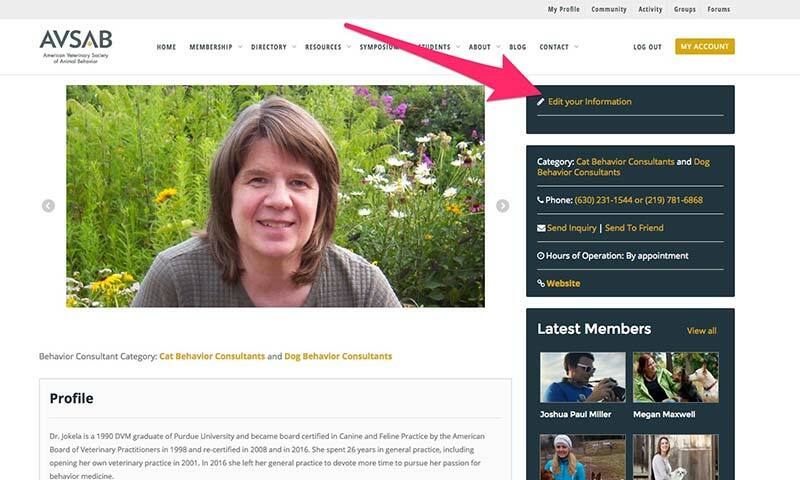 The new AVSAB website features a public directory of animal behavior consultants. Think of it as a searchable database that the public in general can use to find animal behavior consultants to contact. It’s like Yelp but for behaviorists. This directory is completely optional, and it is up to you whether or not you would like to be listed. The benefits of listing yourself or your business in this directory are that it will make you visible to the public on our website, and also visible for the public at large through search engines like Google, Yahoo, Bing, etc. We highly recommend adding your listing if you want to be found by the public for your behavior services. The AVSAB public behavior consultant directory is a great resource for the public to be able to find behaviorists. There are a number of ways to use the search features of the directory to find exactly what you’re looking for. If you’re looking for a list of behavior consultants near you, we suggest entering your zip code. If you’re looking for a list of consultants from a given state, province, or even country, we suggest typing in the name and waiting for the system to auto-suggest your state. Select the auto suggestion to be given a list of all behaviorists for that particular state, province, or country. To do a search for a particular member by name, start typing the name of the consultant in the field labeled “Search by name.” The system may auto-suggest certain consultants based on what you type. If you see who you’re looking for, click on their name from the auto-suggest and hit the “search” button. Or, you can just type their name into the search field and hit search without hitting the auto-suggest feature. Feel free to enter only first or last names if you don’t know the consultant’s full name. If you’re looking for a member with specific credentials, type them into the “search by name” field and click search. If you want to narrow your search by location, you can type the credentials into the “search by name” field and then enter the state or province to search in the “search by State/Province, City or Zip” field. If you’d like to browse the directory by category, select the category from the top of the right hand sidebar. You will be taken to a page with a map of all consultants in that category, and you will be provided with a list of consultants in that category. **Please note that the icon that displays on the map for each consultant is the category they have selected as their “primary” category. If you go to the category page for for “cat behavior consultants” and there are dog icons on the map, that just means that those members do behavior consulting for both dogs and cats – you can still contact them about behavior issues you’re having with your cat. You can edit your listing at anytime. Simply navigate to your listing (you can search for yourself from the main directory page to find it), or click on the “my profile” link at the top right of the page, then click on the “public listing” menu icon, and from the next screen click on your name. For quick access to your listing, click on the “my profile” link at the top right of the AVSAB website. From there, click on the “public listing” tab, and then click the name of your listing to navigate to your public listing page.